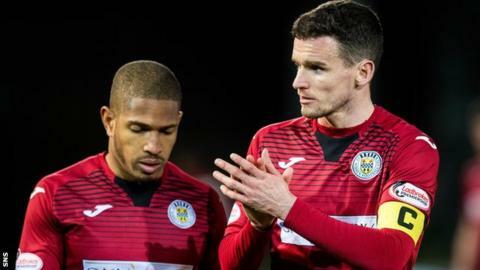 Full-back Paul McGinn acknowledges St Mirren will be "adrift" in the Scottish Premiership should the "unthinkable" happen against Dundee this weekend. Oran Kearney's side are bottom, a point behind Dundee, with Hamilton Academical a further six points clear. And McGinn says the Paisley match-up on Saturday is "vital". "I'm sure us and the other two teams think the rest of the games are all cup finals," the defender told BBC Scotland. "If we don't get a win and the unthinkable happens then we're quite adrift - it definitely makes it important. We need to try and keep Hamilton involved as well so it's vital." Dundee forward Craig Curran stressed the significance of the "massive" encounter. Curran's side have lost four games in a row and the striker says they must focus on catching Hamilton, who visit Kilmarnock on Saturday. "It's massive, there's no point playing it down, the game is huge," said the former Ross County player. "We need to close that gap and close it quick. "I've been in this position before and I know what's needed. We have to win games no matter whether that's playing ugly, playing nice, whatever it is." If Dundee can win, they go four clear. That's two games theoretically. It's a massive opportunity when the impetus could have been with Oran Kearney and St Mirren if they'd got something against St Johnstone on Wednesday. But it's turned full circle now. It's between the three teams - it's like a mini-league. It'll go right down to the wire. I don't think one will stride away but fair play to them if there is because they're having to play football under pressure, be confident, play as a team, be structured and disciplined. So the team that does get that momentum will be the ones who step away from the bottom two. Dundee did well against Celtic in their last game and have a stronger squad than St Mirren. They need to find a mental strength and they need to find it quickly.